A1 - Mineral and Material Characterization The Mathematical Characterization of Raw Materials - A Basis to Design Machines (G. Unland). Lithological Composition and Ore Grindability Sensors, based on Image Analysis (A. Casali, et al.). Automated Characterization of Non-Stoichiometric Minerals (D. Sutherland, et al.). Color Classification of Kaolin Typologies by Neural Networks (A.B. Valim, et al.). On-Line Xrd Analysers for Slurry Samples. Problems and Solutions (J.Nikolov, I. Madsen). Martian Soil and Human Exploration (T.P. Meloy, M.C. Williams). Beneficiation and Mechanical-Chemical Alterations of Natural Zeolites (T.S. Yusupov, et al.). Selective Data Mining for Material Selection (D. Pace, et al.). Substantiation of Classification of Coals by Use of Their Structural-Chemical Parameters (A.M. Gyulmaliev, I.V. Eremin). A2 - Mineral Liberation Stereological Correction of Mineral Liberation Grade Distributions (S.J. Spencer, D.N. Sutherland). Liberation Model Considering Preferential Breakage at Mineral Boundaries (S. Owada, et al.). Mineral Liberation Analysis - A Review of Some Recent Developments (R.P. King, C.L. Schneider). Liberation of a Particle-Composite Material (J. Tomas, M. Schreier). Liberation of Valuable Inclusions in Ores and Slags by Electrical Pulses (U. Andres, et al.). A3 - Process Simulation and Control Scale-up of Tower Mill Performance Using Modeling and Simulation (A. Jankovic, S. Morrell). Column Flotation of Low Cassiterite Contained Slimes: Modeling and Scale-up Using Pilot Plant Data (L.O. Filippov). Micro-Scale Physical Model to Account for Energy Spectrum Distribution in the Ball Mill for Sophisticated Performance Prediction (T. Inoue, K. Okaya). Flotation Process Control on a Pgm Flotation Circuit (A. Singh, J. Schubert). Gain Scheduling Control of a Cement Grinding Circuit Based on its Fuzzy Model (S. Matsuo, Y. Okano). "Data Mining" for Mining Data (H. Hyötyniemi, et al.). Identification of the Distributed Efficiency of a Particle Separation System (G.D. Schena, R.J. Gochin). Experimental Research of Industrial Flotation Machines Process Dynamics (K. Kalinowski, R. Kaula). An Algorithm for Fault Detection and Isolation Using Mass Balance Constraints (D. Hodouin, A. Berton). Dynamic Flowsheet Simulation: a New Tool for Mine Through Mill Optimization (J.A. Herbst, W.T. Pate). The Locus of Flotation Performance (M.A. Vera, et al.). Mineral Processing Process Optimization and Collaboration at the Industrial Desktop (O.A. Bascur, J.P. Kennedy). Establishing the Neural Network Models for Grinding Systems (Y. Mao, et al.). Fine Grinding by High Pressure Roll Mill (A. Bertagnolio, et al.). Simulation of Biotreatments in Complex Mineral Processes (S. Brochot, et al.). Identification and Multivariable Nonlinear Predictive Control of a Pilot Flotation Column (M. Milot, et al.). A4 - Comminution, Classification and Agglomeration Dry Vibration Milling of Blast-Furnace Slag Cement - Parameter Study (Y.M. Wang, K.S.E. Forssberg). Monitoring of Sag Mill Performance Using Acoustic Emissions (S.J. Spencer, et al.). Influences of Operating Parameters and Shape Factor of Particles on Performances of a Dynamic Air Classifier (G. Baudet, et al.). Improving the Air Classification Process by Optimal Operating Parameters (J. Kolacz). Investigations on Abrasive Particle Stress in Spouted Beds and Agitation Cells (H.Z. Kuyumcu, L. Rolf). Vibration Grinding of Copper and Aluminum Metal by-Products (L. Kuzev, S. Seksenov). Mechanical Induced Changes in Structure and Properties of Solids (H. Heegn). Mixture Grinding in the High-Pressure Roll Mill (A.-Z.M. Abouzeid, D.W. Fuerstenau). Advances in the Theory and Practice of Hydrocyclone Technique (T. Neesse, F. Donhauser). Vortex Flow in Flat-Bottomed Hydrocyclones: Leading Order Steady Solution (J. Collantes, F. Concha). Agglomeration Methods in Particle Engineering (W. Pietsch). Pressure and Shear on the Roller Surfaces of High Pressure Roller Mills (U. Sander, K. Schönert). Effect of Grinding Methods on Flotation of Sulphide Ores (R. Kalapudas, et al.). Advances in the Theory and Practice of Novel Comminution Technology (Y.C. Lo). Iron Ore Pellet binding Mechanisms Pozzolanic vs. Physical Binders (S.J. Ripke, S.K. Kawatra). Mathematical Models of the Behavior of Malleable Metals in Tumbling Mills (M. Noaparast, A.R. Laplante). Experimental Investigation of Compacting in Roll Presses with Gravity and Screw Feed (B. Cs&odblac;ke, et al.). A5 - Fine Particle Processing A New Concept for the Process Design of Flocculation Processes (M. Nagel, P. Ay). Characterization and Investigation on the Sorption Behavior of Steelmaking Flue Dust (L.-M. Wu, et al.). Enhancing Top-Size Control in Ultra Fine Grinding (M. Agus, et al.). Development of a New Method of Waste Water Treatment by Hetero-Flocculation with Fluorite (S. Mori, T. Furuyama). The Role of Coagulants and Flocculants in the Control of Compressional Dewatering of Mineral Slurries (K.E. Bremmell, et al.). Dispersion of Oil in Electrolyte Solutions (H. Polat, et al.). Preparation of Inorganically Modified Bentonites Suitable for Thickener and Thixotropic Agents (H.J. Köro&gcaron;lu, et al.). Drag Force on Spheres Settling in Gas-Fluidized Beds (L.B. Wei, J. Chen). Flocculation of Fine Calcite Particles with Corynebacterium Xerosis (S.R. Haas, et al.). Polymer Induced Flocculation/Dispersion of Colloidal Iron Oxide and Alumina Suspensions (P. Somasundaran, et al.). Role of Hydrogen Bonding in Reagent Adsorption for Enhanced Separation Efficiency (M. Bjelopavlic, et al.). A6 - Hydro and Biohydrometallurgy Cyanide Recycling Using Ion Exchange Resins. Application to the Treatment of Gold-Copper Ores (V.A. Leão, et al.). Recovery of Silver and Barite from Silver Plant Tailings and their Economical Evaluation (H. Dinçer, G. Önal). Manganese and Zinc Removal from Cobalt Sulfate Solutions by Means of Solvent Extraction (K. Kongolo, et al.). Cobalt-Magnesium Separation by Solvent Extraction with Bis(2,4,4-Trimethylpentyl) Monothiophosphinic Acid (S.L. Agatzini, P.E. Tsakiridis). Leaching of Precious Metals from Secondary Sources Using Halogen Salts (K.N. Han). Zinc Powder Cementation of Gold from Ammoniacal Thiosulphate Solutions (R. Ravaglia, O. Barbosa-Filho). The Use of Jet Reactor Technology in the Extraction of Valuable Minerals (L. Lorenzen). Thiocyanate Technology for Processing Silver-Bearing Ores and Concentrates (S.B. Leonov, et al.). A Novel Process for Radioactive Impurity Removal from Zircon Sands (H. Aral). Direct Acid Leaching of Pyrolusite Ore (I.A. Ibrahim, et al.). Thiosulfate Leaching of Gold from a Mechanochemically Pretreated Complex Sulfide Concentrate (P. Balá&zcaron;, et al.). Polygermanates and Their Role in the Obtaining Geo2 from Zinc Concentrates (A. de la Cuadra, et al.). Electrowinning of Gold from Cyanide Solutions (G. Cifuentes, et al.). Supported Liquid Membranes in Metals Recovery and Concentration (R. Molinari, et al.). The Use of Silver-Bearing Concentrates in Bacterial Leaching of Chalcopyrite-Containing Ore Material (J. Wang, et al.). A Comparison of Pyrite Oxidation Capability of Three Major Groups of Acidophilic Iron Oxidizing Bacteria (S.A. Bagheri, et al.). A7 - Physical Separation Processing Evaluation of the Effectiveness of Separation Processes According to the Obtained Feed-Segregation Rate (K.S. Sztaba). Packed Column Jig Sets New Standards in Iron Ore Concentration (D.C. Yang, et al.). Correlation Between the Electrical Properties of Quartz, Feldspar and Wollastonite Minerals and Their Tribo-Electric Separation Potential (H.R. Manouchehri, et al.). Advances in Cryomagnetic Separation Process: Industrial Minerals and Waste Effluent (G. Gillet, et al.). Prediction of the Performance of Low-Intensity Wet-Magnetic Separators in the Processing of Partly Altered Magnetite Ores (H.J. Steiner, A. Boehm). A New Electrostatic Separator for Fine Particles (R. Ciccu, et al.). Possibility of Howlite and Colemanite Concentration by Multi-stage D.M.S. Processes (M. Ignjatovic, et al.). Layer Model of Stratification during Screening (M. Soldinger). In-Plant Testing of the Hydrofloat Separator (M. Mankosa, et al.). Hi Filters to Superconducting HGMS: The New Generation (A. Stadtmuller, S. Fawell). Novel Tubular Electrostatic Separators (A.I. Mesenyashin). Influence of Particle Shape on Dynamic DMS Processes (G. Ferrara, et al.). High Temperature Superconductors for Magnetic Separation (J.H.P. Watson, L. Bolt). Theoretical Aspects of Fine Particles Separation (A.V. Bogdanovich, et al.). Study on Producing Low Ash Coal with Triboelectrostatic Separator (X.X. Zhang, et al.). B8a - Flotation - Kinetics and Modelling The Role of Surface Forces in Flotation Kinetics (R.-H. Yoon). Effect of the Suspension State on the Entrainment in Flotation Machines (E.A. Guerra, H. Schubert). The Use of an Ejector-Aerated Baffled Column for Finely Disseminated Sulfide Ore Flotation (V.S. Babineti, et al.). Factors Affecting the Flotation of Free Gold in the Presence of Refractory Gold (J.S.J. Van Deventer, et al.). Modeling the Influence of the Froth Phase on Recovery in Batch and Continuous Flotation Cells (Z.T. Mathe, et al.). Contact Angle and Thin Film Studies on the Cationic Collector/Silica Flotation System (R.J. Pugh, et al.). Selective Flotation of Enargite and Chalcopyrite (W.T. Yen, J. Tajadod). New Investigations on the Rupture Process of Thin Liquid Films at the Particle-Bubble Adhesion (H.J. Schulze, et al.). Hydrodynamics of Conventional Flotation Cells with External Air Blow and its Effect on Metallurgical Results (G.N. Anastassakis). Optimization of Collector, Slime Modifier and Frother Usage in Potash Ore Flotation (J.S. Laskowski, et al.). Particle-Bubble-Water Contact Angle Based on Flotation in a Hallimond Tube (J. Drzymala, V. Vigdergauz). Boltzman's Model of Flotation Kinetics (P. Lazi&cacute;, N. &Cacute;ali&cacute;). Bioflotation of Sulfide Minerals in the Presence of Heterotrophic and Chemolithotrophic Bacteria (P.K. Sharma, et al.). Non-Equilibrium Thermodynamics in the Oxidation and Flotation of Sulfides (V. Avdokhin, V. Morozov). Removal of Deleterious Elements from Copper Sulfide Concentrate (J.A. Mielczarski, et al.). Regularities of Hydrophobisation and Flotation of Salt-Like Minerals (A.A. Abramov). Deep Mechanical Flotation Machines with Axial Impellers and Flotation Columns with Jet Aerators (N.F. Mescheriakov, et al.). Reduction of Graphite in Lead Concentrate During Flotation of a Complex Lead-Zinc Ore from Rajpura - Dariba, India (K. Das Kalyan, et al.). Flotation in a Pulsating Medium (G. Krasnov, et al.). Effect of High-Intensity (Pre)Conditioning of Pulp on the Flotation of Sulphide Ores (C. Aldrich, D. Feng). The Use of an Image Processing Based Sensor for On-Line Analysis of Flotation Performance (B.A. Wright, et al.). Processing of Iron Ore by Reverse Column Flotation (E.C. Dowling, et al.). Comparative Studies of the Surface Acid-Base Properties of Pyrites from Coal and Ore Sources (A.M. Raichur, et al.). 3d Froth Modeling by Image Analysis (G. Bonifazi, et al.). Column Flotation Improves Metallurgical Results in Non-Ferrous Ore Concentration and Matte Separation (I.I. Maksimov, et al.). B8b - Flotation - Surface Chemistry and Reagents The Synergistic Interactions of Mixtures of Thiol Collectors in the Flotation of Sulphide Minerals (C. Helbig, et al.). Surface Properties of Diamonds in Kimberlites Processing (V. Chanturiya, et al.). Copper Selective Collectors in the Separation of Sulfide Minerals (D. Fornasiero, et al.). The Effect of Polymeric Depressants and Inorganic Dispersants on the Surface Characteristics of Talc (M.A. Dalvie, et al.). Landfill Leachate as a Frother and Collector in Froth Flotation (S.T. Hall). Effect of Ca2+ and S2O32- on the Flotation of Pentlandite in Real Ore System (N. Schreithofer, et al.). Surface Properties and Floatability of Enargite (S.H. Castro, S. Honores). Spin-Marked Reagents in Flotation (P.Solozhenkin, et al.). Mineral/Solution Equilibria and the Flotation Chemistry of Magnesite with Oleate Collector (D.W. Fuerstenau, et al.). Liquid-Liquid Extraction of Fine Oxide Particles Using Chelating Reagent as Collector (E. Kusaka, et al.). Semiconductor Energy-Band Theory of Sodium Humate Interacting with Sulphide Minerals and its Application in Flotation Separation (Q. Feng, et al.). Effect of Calcium on Sphalerite Activation with Copper (C. Sui, et al.). The Effect of Pulp Potential Control on the Metallurgical Performance of a Lead/Copper Bulk Flotation Stage (A. Uribe-Salas, et al.). Technology for Copper-Zinc Flotation by Electro Chemical Treatment (V. Panayatov, et al.). Floatability of Zircon with Sodium Oleate (R.A. Murato&gcaron;lu, et al.). Mineral Separation in the Processing of Complex Nickel-Copper Ores Using Chelating Agents (S. Kelebek, C. Tukel). Enhancing Flotation Recovery of Phosphate Ore by Nonionic Surfactant (H. Sis, S. Chander). Adsorption of the Thiol Compound on Gold and Pyrite and its Influence on Their Selective Flotation (M.B.M. Monte, et al.). On the Fundamentals of the Surface Chemistry of Cadmium Ion Flotation (I.B. Scorzelli, et al.). Investigations Into the Surface Chemistry of Some Sulfide Minerals Using a Natural Polysaccharide (R.K. Rath, S. Subramanian). Selective Flotation of Chalcopyrite and Pyrite and the Effect of Ore Type (Q. Broadbent, et al.). Polyoxyethylenic Nonionic Surfactants as Collectors in the Flotation of Quartz and Feldspar: Effects Induced by the Addition of Cationic Surfactant (M.S. El Salmawy, et al.). Electrochemical and Electrokinetic Properties of Carrollite and Chalcopyrite and their Flotation Behaviour (L.K. Witika). Study on the Effect of Collector Type and Collector Mixing in Coal Flotation (A.M. Saleh, et al.). B9 - Plant and Process Design Flowsheet Optimization Using Simulation: A Gravity Concentrator Using Reichert Cones (R.P. King). Application of Multifeed Circuits for Coal and Molybdenite Flotation (D.W. Fuerstenau, et al.). Industrial Practice of Phosphate Ore Flotation at Serrana-Araxá, Brazil (R. C. Guimaraes, A.E.C. Peres). Re-Engineering of the Uranium Ore Flowsheet (F. Aurelian, et al.). Treatment of Gold Tailings with the 3PC-Column Flotation (L. Valderrama, et al.). B10 - Process of Complex Ores Removal of Magnesium from Phosphates and Phosphoric Acid (P. Blazy, E.A. Jdid). An Equation of State for Trona Solutions (H. Haynes Jr., P. De Filippis). The Role of O2, N2 and Their Mixture at Different Proportion of N2 on the Formation of Sodium Chromate (M.E.H. Shalabi, et al.). Comprehensive Processing of Copper-Sulfide Ores Resulting in the Production of Rare Metal Concentrates (Z. Abisheva, et al.). Processing of Oxidized Zinc-Lead Bearing Raw Materials (V. Luganov, M. Bitimbaev). B11 - Processing of Raw Materials for Glass and Ceramics Development of Iron Removal Process Design for High Purity Silica Sands Production by Oxalic Acid Leaching (F. Veglio, et al.). The Benefits of Blast Furnace Slag for Glass Production (M.F. Eskibalci, B. Ipeko&gcaron;lu). B12a - Waste Treatment and Recycling Various Kinds of Plastics and Paper Separation Using Electrostatic Separation and the Combination of Sink-Float Separation and Flotation for Recycling (T. Fujita, et al.). Mechanical Processing of Low Grade Printed Circuit Boards (J.A. van Houwelingen, C. Le Guern). Environmental Protection from Mineral Wastes (S. Hoffman). Transfer of Mineral Process Models to Waste Treatment (K.L. Sandvik, et al.). Instruments for Improving the Material Flow of Aluminum Alloy Recycling (H. Hoberg, et al.). Utilization of Fly Ash in Mineral Wool Production (I. Simovic, et al.). Flotation of Plastics Using Combined Treatments (N. Fraunholcz, et al.). Plastic Waste Grinding (F. Ciancabilla, A. Bonoli). Recycling of Rare Earth Luminophores Originating from Discharge Lamps (E. Gock, et al.). B12b - Waste Treatment and Recycling (Effluent Treatment) Decontamination of Cadmium from Industrial Liquid Waste by Coconut Fiber (A. Espinola, et al.). Production of H2s By Sulfate-Reducing Bacteria in a Two-Column Gas/Liquid Reactor for the Purification of Metal-Containing Effluents (F. Battaglia-Brunet, et al.). Water Treatment of Manganese-Rich Mine Drainage by Manganese-Oxidizing Bacteria at Neutral Ph (K. Sasaki, et al.). Bioprocessing of Actinoids by Using Microorganisms (T. Sakaguchi). The Treatment of Acid Mine Drainage through the Precipitation of Ettringite (F.W. Petersen). B13 - Soil Remediation Complexing Agent Using both Chemical and Electrochemical Processes for the Removal of Heavy Metals from a Contaminated Soil (A. Djordem, et al.). Novel and Efficient Technology for Contaminated Soil Cleanup (K. Szymocha, et al.). Distributions of Contaminants in Electrokinetic Processing of Fine-Grained Soils (M. Niinae, et al.). Remediation of Contaminated Sandy Soil Fractions Using High-Performance Attrition (B. Schricker, et al.). Removal of Oil Contaminants from Soil by Flotation (M. Niewiadomski, et al.). Chemical Processes for Radioactive Waste Treatment (T. Dovbysheva). C1 - Mineral and Material Characterization Characterization of Particles by Means of Laser Light Diffraction and Dynamic Light Scattering (U. Foerter-Barth, U. Teipel). Industrial Treatment of Raw Agate: Spectrocolorimetry and Scanning Electron Microscopy (Sem) Analyses (L.C.B. Tubino, C.H. Sampaio). Back-Scattered Electron Imaging of a Lateritic Iron Ore and its Applications in Process Mineralogy (A. Alcover Neto, et al.). Chemical Reactivity of Different Phosphate Minerals for Direct Application as Fertilizers (S.I. Mostafa, et al.). C2 - Mineral Liberation Poor Manganese Ore Dressing on the Basis of Mineralogical-Technological Studies (E.L. Chanturiya, et al.). Prospective of Electric Impulse Processes for the Study of the Structure and Processing of Mineral Raw Materials (A. Usov, V. Tsukerman). C3 - Process Simulation and Control Pulp-Froth Interface Control in the Flotation Column (A.C. Maffei, I.L. de Oliveira Luz). Acoustic Emissions from the Impact of Particles and their Application of On-Line Monitoring for Zirconia Micro-Agglomerate Production in Liquids (T. Hirajima, M. Tsunekawa). Strategies for Fuzzy Control of a Water/Air Column (M.T. Carvalho, F. Durão). Improving Controllability on Flotation Columns (L.G. Bergh, J.B. Yianatos). Cost Cutting in Optimizing a Flotation Unit by Use of Statistical Methods (H.-C. Haarmann, et al.). Validation of the Discrete Element Method (DEM) by Comparing Predicted Load Behaviour of a Grinding Mill with Measured Data (M.H. Moys, et al.). 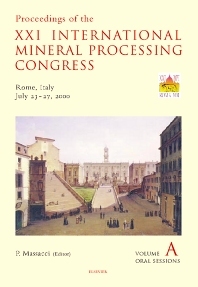 Design and Implementation of an On-Line Optimizing Control System for Processing the Sadiola Hill Oxidised Gold Ore (T. Mulpeter, O. Guyot). On-Line Prediction of Transient Phenomena in the Slag Phase during Ilmenite Smelting (J.J. Eksteen, M.A. Reuter). The Uniform Description of Mineral Processes by Methods of Compound Distributions of Material Features (T. Tumidajski). Arma Type Model for Copper Ore Flotation (K. Trybalski, J. Cieply). C4 - Comminution, Classification and Agglomeration Operational Work Index for Grinding Plants (G.D. González, et al.). Magotteaux Automatic Ball Charger (Abc) (W. Conger, P. Amelynck). Breakage Parameters of Chromite and Simulation of the Product-Size Distributions (M. Yekeler, et al.). Run-of-Mine Milling Pilot Plant Test Work (B. Clermont). The Effect of Viscosity on Small-Diameter Hydrocyclones' Performance in Desliming Process (M.V. Possa, J.R.B. Lima). Drum Granulation of Mineral Raw Materials with Different Particle Size Distributions (T. Gluba, A. Obraniak). Studies on Comminution Mechanism of the Dry Tower Mill Kd-3 (A. Shibayama, et al.). Improvement in Classification Performance of Turbo Classifiers by Reducing the Inertial Counter-Rotating Vortices (J. Liu, et al.). Optimized Production Scale Classifier for Finest Cuts at High Capacities (M. Adam, S. Zampini). The Influence of Comminution Method to Particle Shape (M. Oja, R. Tuunila). Maxxmill - a Field Report about the application of a Stirred Ball Mill with Increased Economic Efficiency for Grinding of Minerals (J. Sachweh). The Kelsey Fine Autogenous Grinding (Fag) Mill (B. Kelly, D. Geraghty). The Effect of Using Concave Surfaces as Grinding Media (F.L. von Krüger, et al.). Studies in Fine Grinding in an Attritor Mill (P. Raghuraman, et al.). Role of Particle Microstructure in Comminution (L.M. Tavares). C5 - Fine Particle Processing Formation of Fine Particles with Compressed Gases (U. Teipel, U. Foerter-Barth). Dewatering of Fine Granular Materials by Vibrating Screens with Superposed Capillary Suction (A. Ettmayr, et al.). Production of Rheological Additives for Solvent Based Pain from Turkish Bentonite (K. Cinku, et al.). Flocculation and Adsorption-Desorption Mechanism of Polymers on Albite (I. Kur&scedil;un, et al.). Theory and Applications of Hydrophobic Flocculation Technology (S. Song, S. Lu). C6 - Hydro and Biohydrometallurgy The Dissolution and Interactions of Gibbsite Particles in Alkaline Media (J. Addai-Mensah, et al.). Evaluation of an Hcl Process for Leaching of Low-Grade Highly Siliceous Bauxite Ore from Khushab, Pakistan (S.A. Hussain, R. Jamal). Application of Solvent Impregnated Resin to the Treatment of Heavier Rare Earth Residue (J. Shibata, et al.). Gold Extraction from Kaymaz Gold Ore by Thiourea Leaching (S. Örgül, Ü. Atalay). Synthesis of Aragonite by the Carbonation Process Using Stainless Refining Dust in Iron and Steel Plants (J.H. Ahn, et al.). Development of an Iron Removal Process from Kaolin by Thiourea Leaching: Kinetic and Related Statistical Analysis (F. Vegliò, F. Beolchini). Application of Thiobacillus Ferrooxidans by Bacterial Desulfurization of Coal (P. Fe&ccaron;ko, V. Sedlá&ccaron;ková). The Adsorption of Precious and Base Metals on Xad7 Ion Exchange Resin (E.R. Els, et al.). The Influence of Precipitation Variables on the Aggregation and Crystalline Structure of Stabilized Zirconia Powders (A.P.A. Oliveira, M.L. Torem). Solvent Extraction of Cu (Ii) and Fe(Iii) using Lix 1104sm (P. Navarro, et al.). A Comparison of Lix984® and Non-Conventional Reagents as Copper Extractants (J.B.A. Paulo, J.Y.P. Leite). Development and Application of Filblast Mass Transfer Technology in Hydrometallurgical Processing (B.J. Sceresini, G. Nguyen). Selective Separation of Yttrium from Chemical Concentrate of Rare Earth (E. Panturu, et al.). C7 - Physical Separation Processing The Separation of Coarse Particles by a Moving Froth Bed (J.S.J. van Deventer, et al.). A New Magnetic Separator and Classifier: Case Study (P.A. Augusto, J.P. Martins). Removal of Sulfur and Mineral Matter from Coal Slurry by a Pilot Scale Wet Magnetic Separator (H. Dinçer, et al.). Study of Separation of Refractory Sulfide Minerals by Hgms (Y. Zhang, et al.). Electrostatic Feldspar/Quartz Separation without Hydrofluoric Acid Reduces Pollution (S. Dorfner, et al.). Assessment of Multistage Turbulent Cross-Flow Aeroseparation of building Rubble (J. Tomas, T. Gröger). Separation Technology Based on Segregation Effects in Fast Gravity Flows (V. Dolgunin, et al.). Trapped Vortex Magnetic Separation (Tvms) (Z. Li, J.H.P. Watson). General Trends of Gravity Separation (M. Barsky, E. Barsky). C8a - Flotation - Kinetics and Modelling An Investigation into the Enrichment of Phosphate Slime by Column Flotation (H. Ipek, H. Ozdag). An Investigation of the Effects of Ore Grade and Particle-Liberation Size in Gold Recovery by Coal-Oil-Gold Agglomerate Flotation (Y. Cilingir, S. Sen). Characterization of Rigid Spargers and Selection for Flotation Columns (C.O. Gomez, et al.). An Interactive Dynamic Flotation Model Framework (O.A. Bascur). A Computational Fluid Dynamics (CFD) Model for a Bubble Separation Tank (P.R. Desam, et al.). Characterization of the Flotation Froth Structure and Color by Machine Vision (Chaco) (G. Bonifazi, et al.). C8b - Flotation - Surface Chemistry and Reagents New Synthetic Polymeric Depressants for Sulfide and Non-Sulfide Minerals (D.R. Nagaraj). Valorisation of Molybdenite from Majdanpek Copper Concentrate (D. Salatic, V. Salatic). Characterization of the Surfaces of Galena and Sphalerite in the Presence of Dithionite (C. Sui, et al.). Collector Properties of New Flotation Reagent Z-96 (Z.S. Markovic, et al.). Beneficiation of Fine Bituminious Coal by Column Flotation (B. Gürsu, et al.). Studies of Surface and Sorption Behaviour of Saline and Clay Carbonate Minerals in Electrolytes (S. Titkov, et al.). Activation of Xanthate Flotation of Pyrite by Ammonium Salts Following it's Depression by Lime (X. Xiaojun, &Scedil;. Kelebek). Modified Hydroxamate Collectors for Kaolin Flotation (C. Basilio, et al.). Monitoring the Distribution of Flotation Chemicals at an Industrial Mineral Processing Plant (M.S. Miettinen, et al.). Azine Compounds Application in Separation of Polymetallic Sulfide Concentrates (T.I. Yushina, A.A. Abramov). On Certain Aspects Controlling Selectivity of Non-Sulfide Mineral Flotation (A.V. Kurkov, et al.). Purification of Brazilian Kaolin Clay by Flotation (A.B. Luz, et al.). Ways to Increase the Efficiency of Flotation Process for Complex Ores (V. Beloborodov, K. Fedotov). C9 - Plant and Process Design Technology for Separation of Non-Ferrous Metal Minerals with Similar Physical and Chemical Properties (A.V. Tarasov, V.A. Bocharov). Physical Separation Processing of a Bulk Tin-Tungsten Pre-Concentrate Into its Individual Constituents for Commercial Applications (A.T. Sutaone, et al.). Old Tailings Dumps of Concentrating Plants as a Source of Raw Minerals (V.M. Izoitko, Y.N. Shumskaya). C10 - Process of Complex Ores Pre-Concentration of a Low-Grade Sulfidic Copper Ore from Murgul-Çakmakkaya Region of Turkey (A. Gül, G. Önal). Processing of Valuable Vein-Minerals, as Molybdenite, Monazite, Magnetite, Pyrite and Ilmenite (M. Zlagnean, et al.). C11 - Processing of Raw Materials for Glass Ceramics Carrier Flotation of Alunite from Kaolin Clay (S. Koca, H. Koca). Multicolor Optical Sorting: a Large Scale Application in a Feldspar Treatment Plant in Sardinia - Italy (B. Anselmi, H. Harbeck). Beneficiation of Low Grade Feldspar Ores for the Ceramics Industry (M. Agus, et al.). Beneficiation of Sand from the Sava-River Bed (B. Salopek, G. Bedekovi&cacute;). Controlled Processing of Raw Materials for Ceramic Paste Components (F. Durão, et al.). Beneficiation Studies on a Spodumene Ore from Portugal (A. Botelho de Sousa, et al.). C12a - Waste Treatment and Recycling Comminution of Scrap and Metals in Shredders with Horizontally and Vertically Mounted Rotor (G. Timmel, et al.). Employment of Foundry Wastes (M.C. Zanetti, et al.). Production of Magnetite Powder and Recovery of Non-Ferrous Metals from Steel Making Residues (A. Delalio, et al.). Interactions Between the Toner Composites and Cellulose and Their Implication to Flotation Deinking (Y. Hu, et al.). Beneficiation of Brass Ashes (S. Timur, et al.). The Liberation of Impregnated Gold from Wood Chips (W. Martin, et al.). Recycling of Industrial Waste Materials: Recovery of Aluminum from Leftover Bottle Cap-Liner Materials (S. Sano, et al.). Characterization and Recycling of Amalgam from Dental Clinics (J.Y. Pereira Leite, C. Pereira de Souza). C12b - Waste Treatment and Recycling (Effluent Treatment) New Technique for the Separation of Finely Dispersed Mercury from Philippine Small-Scale Gold Amalgamation Effluent (L.J.G. Lanticse, et al.). Treatment of Dye Bearing Effluents from Brazilian Agate Industry (E. Carissimi, et al.). C13 - Soil Remediation Microbial in Situ Treatment of Soils Contaminated with Radionuclides (S.N. Groudev, et al.). Humic Asids from Coal as a Reagent to Soil Remediation (E.G. Gorlov, et al.). These three volumes (Golden Nuggets) present the latest knowledge in the science and technology of mineral processing and new industry applications, related to the following topics: mineral and material characterization and liberation, comminution, classification and agglomeration, hydro and biohydrometallurgy, physical separation processing, flotation, and process simulation and control. Due to the increasing application of mineral processing techniques in waste treatment, recycling and soil remediation have received special attention. The three volumes present a selected collection of peer-reviewed papers devoted both to the theory of mineral processing (Volumes A and B) and to process design and plant application (Volume C).